El Dorado was the first unofficial expansion for BANG!. It was designed by BANG! aficionado Jidan over at bang.cz in 2006, and has been mentioned here and there since. In many ways, El Dorado was the spiritual ancestor to Wild West Show. El Dorado already conceived of how the event cards could be altered by the actions of a player. Instead of playing a Wells Fargo or Stagecoach to flip over the next event card, El Dorado had players either play or discard an Ace. El Dorado also added a new role into BANG!, but not one that was permanently passed out with the rest at the beginning of the game. The “Grave Digger” was a role that could be adopted by the first player who died when it, as an event card, was in play. The Grave Digger was met with mixed reviews, but it was definitely a staple of El Dorado. 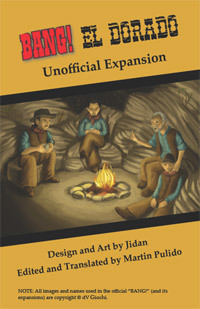 An English translation of El Dorado was put together by Rangi in 2006, and the expansion used art from the western film, Lemonade Joe. It even came with a classy tuck box! While it allowed English players to fiddle with El Dorado, much of the language was confusing, using terms such as “random distance” for instance. Some cards could not be understood, and others left huge holes in the gameplay. While Jidan answered a few of the questions English players had, many were not addressed, and he has long since abandoned updating El Dorado. However, before doing so he updated the Czech version with both new art and some new cards. In an effort to make El Dorado more accessible to English speakers, I reinterpreted and rephrased the old El Dorado text. It should now be wasy to understand all the cards. Where there were conceptual holes in some of the event cards before, I have filled them in with my own interpretations and from what I have been able to garner from Jidan’s comments at www.bang.cz. I have also updated the English version with the updated art from Jidan’s czech version. Two examples of this are below: the old version is on the left, the revised version on the right. Besides this, I have also taken the liberty to change certain cards. I felt that certain cards, such as Desperados and Cavalry, unacceptably allowed for players to flip their role cards over. I think that having to trust that your deductions are correct is crucial to the core of BANG! and so I altered them to no longer involve revealing roles. 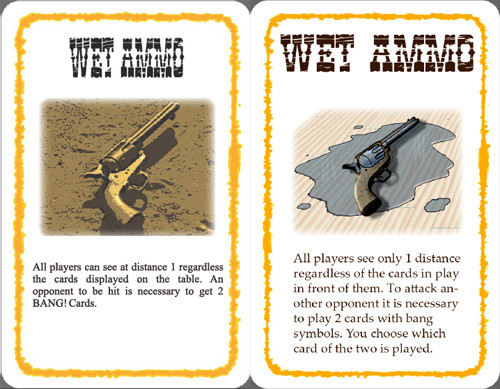 Nonetheless, I tried to capture the essence of such cards, providing ways in which the Sheriff still benefited from Cavalry, and players who shot at the Sheriff benefited from Desperados. While I would have removed Winifred from the El Dorado deck, Jidan already did so in the Czech version. Thus, I included “Hold Up” instead. I confess that I was not able to understand the Czech on this card the best, despite consulting dictionaries, but I think I came to an acceptable altenative to the original. Finally, on the forums there was some discussion of problems with “Grave Digger.” The first was the problem of players trying to die quickly to become the Grave Digger. The second problem was the difficulty of determining what should occur when a Deputy, the Grave Digger, and the Sheriff remained in the game. Some have suggested removing Grave Digger from the game because of these problems, but I think he is a special element of El Dorado that should remain. I have tried to deal with this challenges in a satisfactory way in the rules below. I hope that you will enjoy this re-release and retranslation of El Dorado. If you enjoyed Wild West Show, A Fistful of Cards, or High Noon, I am sure that you will find that El Dorado is up your alley! It is also easier to produce--it doesn’t really matter if event cards are on any nice card stock or not. If there are any improvements you think I can make to the English translation, or you note any other conceptual problems, feel free to contact me by leaving a comment here at The BANG! Blog or by writing me at martinpulido@gmail.com. In the original El Dorado sheets was a sheet to make a propre box to hold the cards. Maybe you can add this? In High Noon, the last card is always "High Noon" and this card will exist until the game ends. What about El Dorado? Should we put "El Dorado" in the bottom as the last card? If not, what should we do when we exhaust the last card? I see why you would want to do that to have consistency, but El Dorado does not have the sort of game ending gameplay (like Fistful of Cards, High Noon, or Wild West Show), so I think you can have it in play all the time. I would simply reshuffle the deck when you exhaust the last card, and flip anew. Thinking you never found the tuckbox files. BTW - Your site is great, your dedication to this game is amazing. Let me start by saying I love event cards at 2 1/8 x 3.5 size. I would even consider reprinting my Official event cards in this size (things would fit a little better in the bullet). Been playing bang for a few years...finally printed Death Mesa a week ago even though i know about it for a year. I like it so much i have since printed Eldorado and OK Corral to test. After reading them i decided on some changes before playing. The Eldorado changes will be posted here. Horse Thief - Removed Scope and Hide out from the list. This will include any other horse cards put out in subsequent expansions via house rules. Wild Shot - added a notation "J Q K = 10 A = 11"
Wet Ammo - Removed the distance mechanic...i like it but think it does not fit this card. 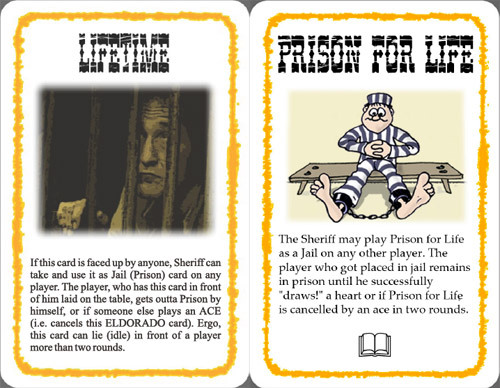 Prison for Life - Removed the two round stipulation, now only cancelled buy Ace for new Eldorado card or Heart. "Starting with player who flips Wild Ride player "draws!" wild ride is cancelled on Ace else miss turn. Ride continues for all players until cancelled by and ace. *** i know this is a major change but i felt aces were rare enough that many turns could be lost, even more of a nightmare in a 4,6,8 player game where the same players lose many turns. Sioux Chief - Changed final sentence to Player/s who do not receive a card must discard a bang or lose a life. There is no guarantee that all players are holding cards. Further than that i don't see why Dough Badman is detrimental to the sheriff but left it and i real don't like Devils pact but see it not being useful often so for the rarity if the outlaws can kill a deputy/renegade on the turn its out they can have it. Let me know what you thin about the changes. Looking forward to play testing soon. "..., with 3 life points if his character had a 4 life point limit and with 2 life points if his character had a 2 life point limit." Should be: "and with 2 life points if his character had a 3 life point limit."? Thank you such an informative post. Emperor Clubs is an Online Casino in Malaysia that offers more than just casino games. Highest quality of Slot Game Malaysia with excellent graphics that really can help reduce stress, have fun as well as refreshing your mind.